What products are compatible with SleepPhones®? 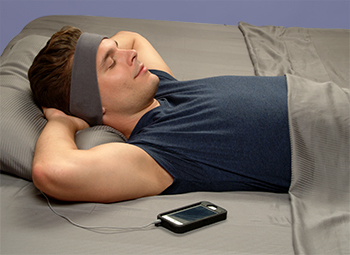 Smartphones, iPods, MP3 players, computers, tablet, radios, CD players and noise machines will work with SleepPhones®. For the wired models, devices need to have a standard 3.5mm jack. To use the wireless model, devices must have Bluetooth® capability for pairing. Do SleepPhones® mute external noises? SleepPhones® were constructed to minimize ambient noises. Users listen to music or white noise to help them to relax, which enables them to fall asleep faster and helps to reduce background noises. However, the product does not have any external equipment to eliminate noise. SleepPhones® were designed to be noise blocking, not noise canceling. Are binaural beats an effective way to sustain sleep? Research on binaural beats shows that it is quite effective in inducing the frequencies associated with sleep in your brain. When listening to soundtracks that utilize binaural beat technology, you may be aware of a soft humming which is actually the binaural beats. Try to not focus on the sound. Ideally, they should be barely audible when you listen to the soundtracks that the binaural beats are incorporated in to. There are other factors that can impact binaural beats, such as Dolby technology or certain sound enhancements that your music player may use. Those technologies need to be turned off. Sometimes computers will read music files in different ways, and going from one medium to another using different file types and file compressions will also impact the binaural beats. We agree that it's a complicated technology. That's why we offer CDs that will definitely transmit the specific sounds you seek - as long as they are played on a CD player that does not distort the sounds with enhancements like Dolby. Can you still hear an alarm clock while using SleepPhones®? Yes, users will be able to hear an alarm clock. It will only be slightly muffled by the fabric around the ears. We feel that being able to hear a fire alarm or a child monitor in the middle of the night is important. SleepPhones® were designed to be noise blocking, not noise canceling. Can SleepPhones® be used for purposes other than sleep? Absolutely! Since the speakers have a full frequency response, SleepPhones® can be used to listen to music, meditation, hypnosis, self-improvement, biofeedback, audiobooks, or podcasts. They are a great travel companion! Can SleepPhones® be used by someone who is hard of hearing or who uses hearing aids? SleepPhones® can play music quite loudly, so user’s can turn up the volume to compensate for mild hearing loss. For customers listening to music utilizing the binaural beats technology, the benefit may not work as well if the hearing loss is not the same in the left and right ears since the binaural beats are based on a stereo sound principle. Many people with hearing aids have reported that SleepPhones® work well with them. However, SleepPhones® do not have the T-switch technology. Individual results will vary.